In Reversal, Florida Gov. Scott Agrees To Medicaid Expansion : Shots - Health News Florida's expansion of Medicaid will provide health insurance coverage to more than a million people. Florida will also become the seventh state headed by a Republican to agree to take the federal offer to provide Medicaid to all state residents with incomes up to about $15,000 a year. Perhaps Florida Gov. 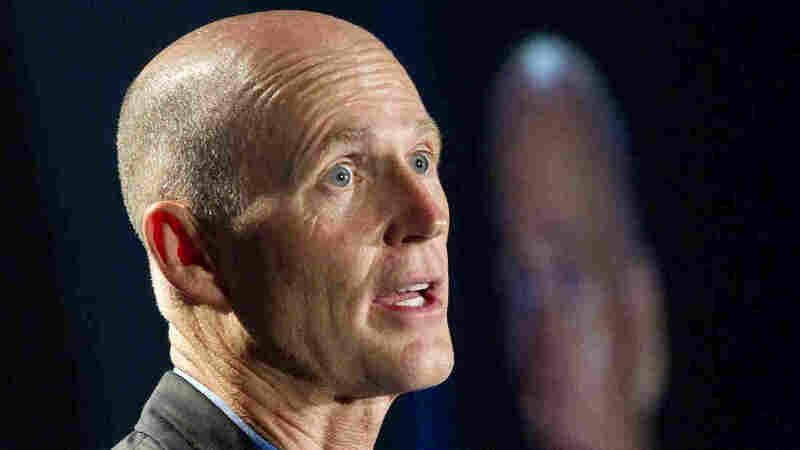 Rick Scott's motto should be "never say never." After the U.S. Supreme Court upheld the administration's Affordable Care Act but made the expansion of the Medicaid program voluntary last June, Scott vowed that his state wouldn't participate in the expansion of the program for low-income Floridians. The vast majority of the cost would be paid by the federal government, but that didn't matter to Scott. "Florida will opt out of spending approximately $1.9 billion more taxpayer dollars required to implement a massive entitlement expansion of the Medicaid program," said the governor in a statement last July. But Wednesday, Scott, a Republican, pulled a complete turnabout. He said Florida would accept the federal government's offer of funding, at least for the three years it has promised to pay the entire bill. The decision "is not a white flag of surrender to government-run health care," he said. Instead, he called the Medicaid expansion a common-sense solution for real health care problems. "Quality health care services must be accessible and affordable for all — not just those in certain ZIP codes or tax brackets," he said at the briefing. "No mother, or father, should despair over whether or not they can afford — or access — the health care their child needs. While the federal government is committed to paying 100 percent of the cost of new people in Medicaid, I cannot, in good conscience, deny the uninsured access to care." Florida's expansion of Medicaid is expected to provide health insurance coverage to more than a million people. Florida also becomes the seventh state headed by a Republican to agree to take the federal offer to provide Medicaid to all state residents with incomes up to about $15,000 a year. One reason so many people were watching Florida is that the state led the lawsuit challenging the health law that went all the way to the Supreme Court. Scott said the recent death of his mother helped him change his mind. The political landscape changed as well. "We have a Supreme Court decision, and we have an election that says this is the law of the land," he said at the briefing. The decision wasn't made in a vacuum. Scott was lobbied hard by Florida hospitals. They were concerned about losing money they now receive from the federal government to care for uninsured people. Groups supporting the expansion were quick to praise the governor's action. "This is truly a hallelujah moment for working families throughout the state, and it augurs well for other Republican governors making the same decision for their states," said Ron Pollack, executive director of Families USA.